?Ku?ool? is our first in a series of designs whereas we are working with some of our ?Friends of the Farm? in bringing their mug visions to reality! This flare shaped Tiki mug features three different, classic Ku Warrior Tiki Gods flanking the mug?s perimeter. The gentleman who brought us this concept is long-time Tiki Farm avid collector Ron Senso. We?re glad Ron stepped up with this direction because this is what we consider a ?hallmark? design? a classic, enduring design executed to an aesthetic standard that will withstand the test of time and always be a perennial favorite of ours and hopefully yours as well. 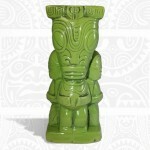 Ku?ool stands 7 5/8" tall and has an approximate 14 oz. fluid capacity.